While traveling to soybean fields around Wisconsin this past week, we have noticed quite a bit of stem canker showing up. 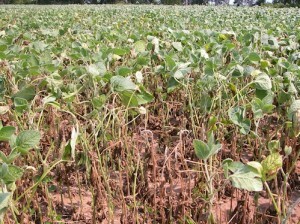 The UW Disease Diagnostic Clinic has also received several samples of soybean in which the disease has been confirmed. There are actually two different types of stem canker caused by related, but different fungi. The fungus Diaporthe phaseolorum var. caulivora causes northern stem canker, while southern stem canker is caused by Diaporthe phaseolorum var. meridionalis. These two pathogens are part of the larger Diaporthe-Phomopsis complex, which consists of Phomopsis seed decay, pod and stem blight, and stem canker. In Wisconsin, northern stem canker is the most common stem canker disease, however, southern stem canker has been found. What Conditions Favor Northern Stem Canker? Cool, wet conditions in the spring and early summer favor infection by the northern stem canker fungus. The symptoms of the disease become apparent later in the season. Considering the cool and rainy weather that has been prevalent over much of the state this season, it isn’t surprising that northern stem canker is prevalent. Figure 2. 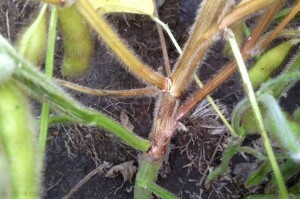 Patches of soybean plants killed by stem canker. What Does Northern Stem Canker Look Like? Initially symptoms of northern stem canker appear as small reddish-brown lesions near nodes. As lesions expand, they can become more brown or gray, but the red border will remain. Eventually lesions of northern stem canker will get large enough to girdle the stems (Fig. 1) and may be confused with Phytophthora root and stem rot. The best way to tell these two diseases apart is to look for the location of the lesion. Generally with northern stem canker, lesions begin at nodes away from the soil line on the main stem and move upward. Phytophthora stem lesions will progress upward from the soil line. Northern stem canker can also occur in patches and damage plants in wide swaths (Fig 2). Northern stem canker can also be confused with white mold when diagnosing above the canopy. Because the lesions can girdle stems, leaf flagging and death can resemble that of white mold damage. Therefore, careful scouting and inspection of the lower canopy and stems in necessary to tell the difference between white mold and northern stem canker. Spores of the stem canker pathogen originate mostly from soybean debris from the previous crop. Therefore, severity of northern stem canker can be higher in fields with minimal tillage. Burying debris can help reduce the severity of the disease. Stem canker can also be more prevalent in fields with high fertility and high organic matter. Stem canker-resistant varieties are also available. Choose varieties with the highest resistance rating possible within the appropriate maturity group for your area. Soybeans rotated with alfalfa may also have a higher incidence of the disease, because alfalfa is an alternate host of Diaporthe. Fungicide application is not recommended for this disease.